Cut Your Lawn Mister? 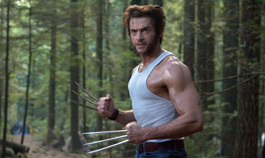 : Wolverine moonlights as Edward Scissorhands in the new X-Men movies. 'X-Men: The Last Stand.' Blessed are the toy makers. THE GOVERNMENT has finally some peace with mutants, thanks to a strangely doddering president (Josef Sommer). Still, Magneto (Ian McKellen) is at large. A blue-haired Beast (Kelsey Grammer) is now a cabinet secretary dealing with the mutant question. The truce ends when a San Francisco gem-tech lab discovers a cure for mutants. The remedy has something to do with the blood of a pale child, meanly called Leech (Cameron Bright of Thank You For Smoking). Heavily guarded though the boy is, Magneto's Brotherhood finds him and determines to kidnap him. Meanwhile, crisis in the Xavier School leaves the Uncanny X-Men in disarray. Worse, the resurrected and all-powerful Jean Grey (Famke Janssen) is now the cataclysmic Phoenix, recalled by all fans of writer Chris Claremont. The mutant warrior who loves her—the sardonic Wolverine (Hugh Jackman)—must try to bring her back. X-Men: The Last Stand is not a shoddy film, and it does what it promises. For those who love superhero combat, the fight scenes make up for the lack of human (or mutant) interest. With 45 years of comic-book mutants to parade out, it's no wonder the playing field gets crowded. Like the third Batman film, this seems to have been made to benefit the toy makers. Director Brett Ratner was everything the photosphere dreaded, a clock-puncher who has the characters hit their marks and speak their lines in loud, clear voices. Under Ratner's direction, the scenes in hallways and bedrooms—the seemingly insignificant pieces that hold a movie together—are almost all seemingly one-take performances by disinterested actors. The well-built, efficient script leads to a series of equal duels: a human rhino called Juggernaut (Vinnie Jones) vs. Kitty "Sprite" Pryde (Ellen Page, quite good), who can fade through walls. Halle Berry's as-usual blank Storm pairs against the super-swift Callisto (Dania Ramirez) and, most literal of all, the fireball-shooting Pyro (Aaron Stanford) takes on Iceman (Shawn Ashmore). One is fire, one is ice, and to finish the ancient show-business joke, what you get when you bring them together is lukewarm water. The first two X-Men films wove in a subtext about the fury of the Culture Wars. X-Men: The Last Stand alludes to the possibility of isolating (and, we can fear, subduing) the "gay gene." But that point isn't sharpened like it ought to be. How swiftly the first film made its case against the normal, in the opening at the muddy outskirts of a concentration camp; how crudely the theme is reiterated here, when Magneto bares the tattooed number the Nazis gave him and makes the prissy threat that no needle will ever touch his flesh again. Where Magneto was once a marvel of pride and craft, here he is more a conventional villain. He leaves his wounded behind; he boasts of the way he uses his disciples as pawns (even Stalin waited until he was behind closed doors to express those sort of feelings). The film is full of bits that could have been made memorable by someone with a more careful hand, someone who could have played for pathos in the scene of a woman barricading her car door against the vengeful demigod who has just lifted the Golden Gate Bridge from its caissons, someone could have brought magic to the revelation of a creature who prefers to do his reading when hanging from the ceiling. Under Ratner's direction, the new X-Men movie doesn't leave you with any tantalizing unanswered questions. An old girlfriend told me she used to wonder how the armor on Michael Keaton's Batman came apart (I got the impression she'd like to try to undo it herself), but here you're sure how everything fits together, at the risk of a lack of mystery and the uncanny. X-Men: The Last Stand (PG-13; 104 min. ), directed by Brett Ratner, written by Simon Kinberg and Zak Penn, photographed by Dante Spinotti and starring Hugh Jackman, Ian McKellen, Halle Berry and Famke Janssen, opens May 26.